It is hard to describe cooler as something refined, beautiful and elegant, isn’t it? But manufacturers of Sovaro coolers don’t think so. They have created unique stylish, luxurious, attractive and functional coolers among ever existing. Sovaro coolers presently are the most outstanding, modern and, of course, functional coolers in the coolers world. Just imagine that keeping your content cold can be so… GLAMOROUS. Have you interested? If your answer is yes, then welcome to our most detailed Sovaro coolers review! Sovaro Coolers. Why So Unique? Looking at coolers with such design you hardly ever can think that each of them is high-end and durable option with great duration of ice retention terms, but it is really so. Manufacturers of Sovaro coolers have managed to create a unique stylish product with a luxurious design and high quality features. Frankly speaking the Sovaro coolers line has been created neither for fishermen or hunters, because they don’t need such luxury in their cooler’s design, nor for office workers, for which an ordinary lunch box cooler will be enough. These coolers have been created for wealthy and prosperous youth who appreciate style and modern look together with high quality in each thing around them. 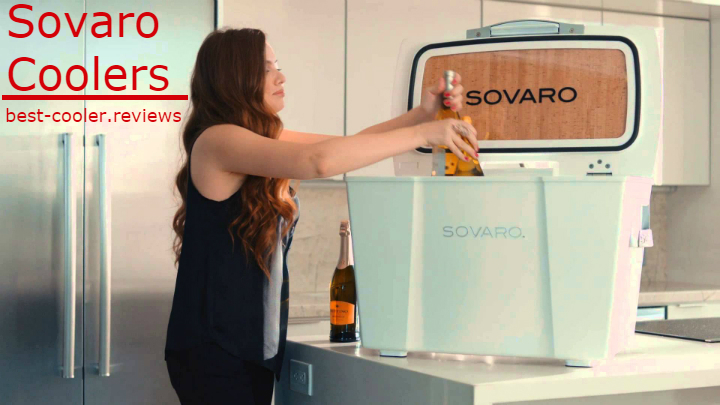 Each representative of Sovaro coolers will perfectly fit to the deck of the expensive yacht, where wealthy and well-dressed people will be sipping champagne that they just have taken from it. Good aged wine and other luxurious beverages will be the ideal content for Sovaro coolers. Maybe giving these examples we have given to you are exaggerated a little bit, but we hope that you understood the idea. In fact Sovaro coolers are the expensive and luxurious premium class coolers for wealthy people. As it was mentioned above, these coolers can boast not only of state-of-art design, but also of their performance and quality. Don’t doubt, they can easily rival with world leading coolers brands. Thus these coolers will amaze you not only with their appearance, but with internal features too. For the additional information about Sovaro coolers check this product page on Amazon for more pictures and customer reviews. Essential Features of Sovaro Coolers. Side Handles / Specially designed molded side handles for easily lifting and transporting of the cooler. Wheels / Durable big wheels will allow you to transport your coolers without any efforts even when it is completely filled. Interior Height / Gives an ability to keep bottles with champagne and wine upright. 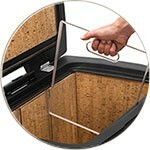 Air-Tight Rubber Gasket / Gives an ability to lock cold air inside and hot air outside of the cooler. 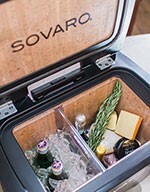 Transparent Divider / Each Sovaro cooler is equipped with special divider for convenient keeping beverages. In a real life each of the above mentioned features contributes to the final result of the convenient and functional cooler which doesn’t have any extra and useless features. Long lasting hinges are designed specially to hold your cooler’s lid open when you need it, so you should not be worrying that it will fall down on your hands when you are taking bottles from the cooler. In addition to this we want to pay you attention that durable wheels and convenient telescopic handle together with molded side handles make these coolers extremely CONVENIENT for transporting. Each coolers manufacturer tries to add to his production some unique features that will distinguish his coolers from other brands. 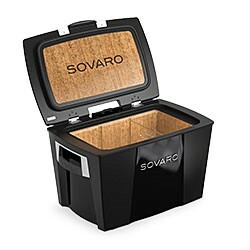 Speaking about Sovaro coolers their main distinctive feature is using of cork. 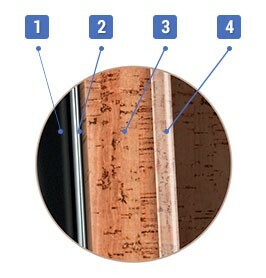 Beside stylish and unique look cork is also an excellent NATURAL insulator that provide users with long ice retention period and durable coolers’ construction. Also cork is impenetrable for liquids and gases, which mean that your cooler will not suffer from splashing water even while standing open on the deck of your yacht. 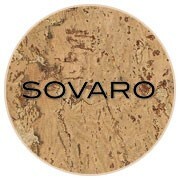 Sovaro manufacturers affirm that cork material is able to withstand temperature about 1,000 degrees Fahrenheit. The great feature for coolers, isn’t it? Speaking about ice retention, Sovaro coolers can beat even such their world famous competitors as Yeti coolers. Many users in their reviews affirm that the duration of ice retention time of Sovaro coolers surpasses other coolers even when cooler is standing under the sunrays. There are many 5-star reviews on Amazon that prove this fact. In fact the duration of ice retention terms of Sovaro coolers can be up to four or five days that make them being at the one row with representatives of world best coolers. If you are interested in comparison of Sovaro and Yeti coolers characteristics, then check our review right here. Let’s eventually sort out why Sovaro coolers are characterized as LUXURIOUS coolers. Which of their features make them so? 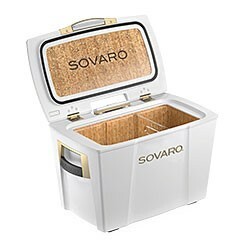 Sovaro coolers have deserved their “luxury” label thanks to their unique style, elegance, aesthetically beautiful design and of course because of using such high quality materials as cork and chrome for their construction. After reading Multiple Amazon reviews our team has noticed that among hundreds positive reviews with compliments were even reviews from people who don’t like coolers and have never use them before. Sovaro coolers have eventually conquered even their hearts. You can find Sovaro coolers available in three different sizes of 30, 45, or 70-quart. Also you can choose them either in white or in black colors. No extra features, no bright colors, only luxury and classic. White color coolers are designed with using of silver or gold accessories while black color coolers are designed with chrome or silver accessories. Sovaro coolers manufacturers have taken care about the special unique accessories for their production. Welcome to our paragraph about Sovaro Coolers Accessories. Each Sovaro cooler is equipped with a special divider which allows you to divide your cooler into two different compartments. The larger options of Sovaro coolers (such as 70 and 45-quart coolers) have two dividers that allow you to separate your cooler into three different parts. For more information about price and characteristics you can check out Sovaro Divider on Amazon. One more useful feature of Sovaro coolers is the additional preparation tray. This tray can provide you with additional area where you are able to keep cheese, various fruits or other shacks. 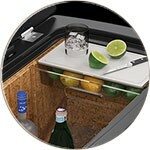 Also it can serve you as the small countertop for convenient preparing your favorite cocktails or slicing fresh fruits. 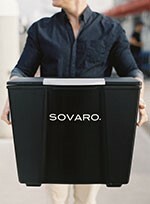 Where can I Buy My Sovaro Cooler? 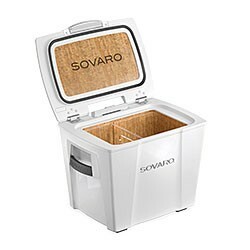 One of the most important questions is where can I purchase Sovaro cooler and how much does it cost? All models of coolers from Sovaro lineup are available on their official website or you can purchase them from Amazon where you will be able to read reviews from other users. Very interesting that on EACH website where you can buy your Sovaro cooler its price is the same. So, you don’t have to look for various websites that offer these coolers at a less expensive price. One more important moment is that chrome and gold accessories in Sovaro coolers design are considered as premium-class options and the cost of cooler with such accents will be a little bit higher than other standard Sovaro coolers with silver decoration. To save your time we have prepared for you a link to all Sovaro coolers available on Amazon. As the conclusion we want to say that Sovaro coolers are unique, ultramodern and at the same time classic coolers that together with their luxurious appearance will please you with the high durability level and quality characteristics. Of course, the price of these coolers is rather high for average person, but these coolers have not been created for everyone. These coolers are created for people who can afford such luxury accessory that will attract the attention and admiring glances of others. So, if you can afford such stylish and really LUXURY cooler, then don’t doubt and stop your choice at the Sovaro coolers lineup.